You’ll love the flavor that fresh cracked grains bring to your beer. The Victoria Grain Mill is a perfect choice for the malt extract brewer who likes to mill their steeping grains the day of the brew. The advantages of cracking your own grain on the day of the brew are many. Fresh cracked grain results in fresher flavors in your beer. Cracking your grain also allows you to buy in larger quantities, keep grain on hand, and design your own recipes on the fly. Note: While this mill could be used by all-grain brewers who mill 10 to 15 pounds of grain per batch, it is not ideal for that purpose. In those cases we suggest a larger mill, such as our MILL400. For those brewers who have been around the block and know about the old Corona Mill, which looks similar to this mill, they are not the same! We put this mill through several tests on both function and grind quality before deciding to sell it. The mill runs off of two plates grinding together to crush the grain. 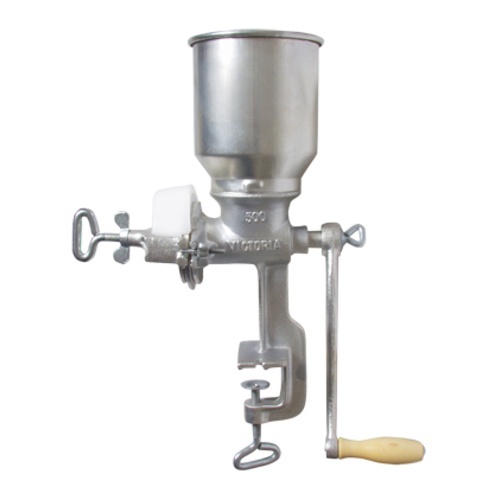 It is fully adjustable to allow for coarse or fine grinds. Clamps easily to most tables. Hopper holds about 1 pound. While the mill handle is removable, hooking up a drill or motor is not recommended nor needed. I'm milling gluten free grains and need something that will mill millet, buckwheat and rice. Not bad! Moves about 30 lbs per hour. First off, I'd recommend disassembling and giving a thorough cleaning to at least all parts that the grain come into contact with. It was kind of greasy/oily, though it may have been a food grade product. Getting it set up for a proper crush only takes a few minutes. I ground around 1/4 cup at a time, checked the consistency, adjusted, and repeated. I got it nailed down in about 4 attempts. It looked just like what I see coming out of the mill at my local homebrew shop. Moving at a steady pace I got 15.25 pounds done in 30 minutes. Given the cost, and that I carry my own 2 grain in bulk now, this is well worth a 30 minute grind. Obviously this will be shorter with less grain. I bought this victoria mill when I was doing extract. It certainly works but I can't imagine milling several pounds of grain through it. Make sure your kitchen counter is compatible with a clamping device. My old kitchen counter didn't have much of a ledge so I made it work with a few pieces of oak and additional smaller clamps. Just bought this, as the local brewing supply store just closed its doors, and I'm considering buying by the 55 lb sack. Ground 15lbs for a bock. Took a bit of playing to get it coarse enough that it wasn't grinding the hulls up too. Got a coarse grind, conversion was good and no stuck sparge. This mill does its job well at a reasonable price. Yes I'll probably convert it so I can use an electric drill rather than get the exercise, but it'll do for now. Glad I bought it. The Victoria Mill: I am an all grain brewer on a budget. So spending big bucks on a high end mill is not on option. Since I have changed to BIAG brewing (to save time and use less water), the mill is perfect in crushing the grains to the right consistency for this style of mashing. The Mill is well made and built like a tank! It is very quick in going through 10 to 11 lbs or grain and it crushes the grain evenly. I had spent many hours reviewing all types of mills and was concerned, after what I had read, that this type of mill was inferior. Not!!! For 1/2 and 1/2 or all grain, this is a great addition to your brewing tools, at a super great price (thank you More Beer!). So that is my review of one of the best products I have bought from More Beer, and I am quite sure that it will not be my last. I'm always looking to adjust my brew techniques by adding not too costly brew products. That is where More Beer stands out, helping me save money while making better beer, faster, and with less waste. Good job! this guy obviously work at morebeer!!!! This is a bargain entry into milling your own grain, but comes with its setbacks. The build quality is not stellar, and the hopper can hop off pretty easily sometimes if you are not careful and are milling pretty vigorously, scattering precious grain! Setting plate distance is not as precise as I would like as well. I was glad to have bought this two years ago when I first jumped to all-grain, but I am overdue on the inevitable upgrade I really need to make.